Religare Health Insurance - Saraswat Cooperative Bank Ltd.
Religare Health Insurance is a specialized Health Insurer, offering health insurance services to employees of corporates, individual customers and for financial inclusion as well. 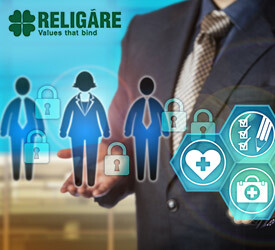 Launched in July 2012, Religare Health Insurance has made significant progress within a short span of time, and is already operating out of 56 offices with an employee strength of 2186, servicing more than 27,00,000 lives (FY’15) across 400+ locations, including over 2500 corporates. It currently offers products in the retail segment for Health Insurance, Critical Illness, Personal Accident, Super Top-up Coverage, International Travel Insurance, Student Travel Insurance and Maternity along with Group Health Insurance, Group Personal Accident Insurance and Group Travel Insurance for corporates. The company was conferred the ‘Best Health Insurance Company Award’ at the prestigious ABP-BFSI Awards 2015 and also received the ‘Rising Star Insurer Award’ at The Indian Insurance Awards 2014. A sudden accident can leave you bedridden and result in absence from work, temporarily or permanently. This can in turn affect your current and future finance by draining your income, ruining the plans you may have had for your loved ones. This is why we bring to you Secure, a personal accident insurance for your safety tomorrow and today. Assure is a critical illness and personal accident cover, specially designed to cope up with life’s uncertainties which come uninvited. It covers up to 20 critical illnesses along with personal accident cover, to stand by you and your family during life’s uncertainties. Explore is an International Travel Insurance that not just covers a travelers medical needs but goes beyond to cover losses arising out of non-medical exigencies as well - such as Trip Cancellation, Loss of Baggage/Passport, Return trip of a minor child etc. The policy takes into account various stages of a person’s travel and issues linked to it. The product is Schengen approved. It covers both In-patient & Out-patient Hospitalization which includes expenses incurred towards dental issues. Along with that the product covers Pre-Existing Ailments. Furthermore it allows a policy holder to avail treatment in home country if required. It also covers Accidental Death & Permanent Total Disability.